GAIN Capital Holdings, Inc. (NYSE: GCAP) has reported its volumes for the month ending November 2015, having again seen a notable decline in its retail business, according to a GAIN statement. Last month, GAIN Capital also orchestrated a marked decline in its over-the-counter (OTC) average daily volume, which reached only $12.0 billion, or -18.1% MoM from September 2015. For the month ending November 2015 however, GAIN Capital’s retail OTC trading volume was reported at $229.5 billion, incurring a MoM fall of -13.2% MoM from $264.4 million in October 2015. Across a yearly timeframe however, November 2015 showed a different picture, even mounting a healthy 3.8% YoY growth from November 2014. Furthermore, the average daily retail OTC trading volume during November 2015 came in at $10.9 billion, falling -9.2% MoM from $12.0 billion in October 2015, coupled with a 1.1% YoY uptick from November 2014. Finally, active retail OTC accounts were numbered at 148,871 in November 2015, securing a marginal 1.0% MoM rise from 148,328 in October 2015. 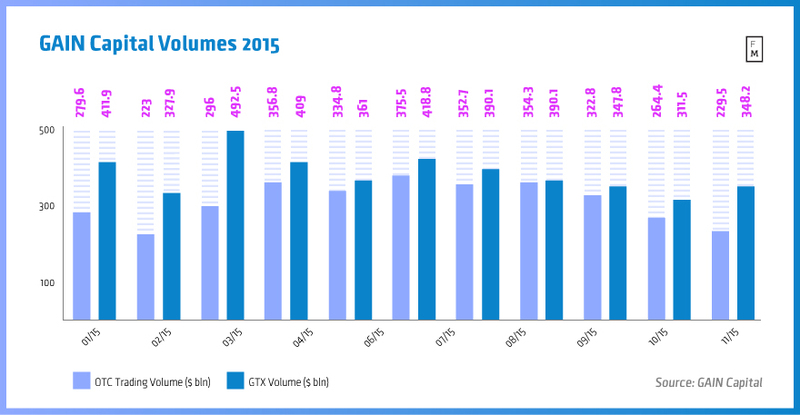 In terms of its institutional metrics, GTX total trading volume was reported at $348.2 billion, justifying an increase of 11.8% MoM from $311.5 billion in October 2015 – conversely, this figure was offset by a -5.1% YoY fall from November 2014. Moreover, the average daily institutional volume at GTX came in at $16.6 billion during November 2015, surging 16.9% MoM from $14.2 billion in October 2015 and 19.6% YoY from November 2014. Ahead of the US open Thursday, GAIN Capital’s (NYSE:GCAP) share prices were steady at $7.69 during premarket trading. The stock has undergone a sizable depreciation from a 52-week high of $10.38 this past June, having since made several attempts at the $7.00 handle with a 52-week low of $6.91.